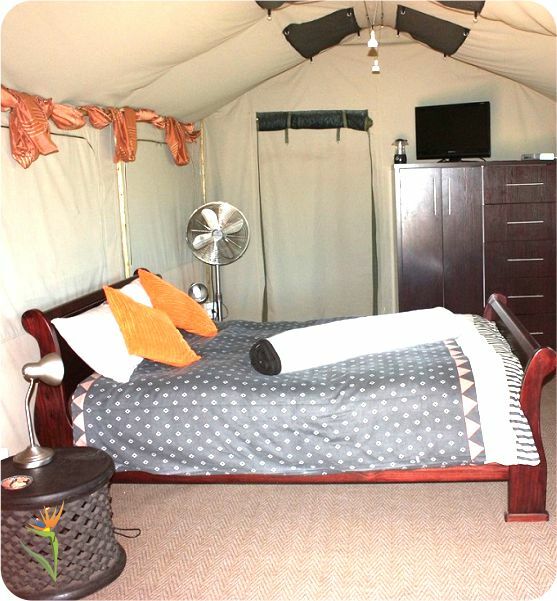 The Maluti has a queen size bed and an en suite bathroom with shower and spa bath. For your convenience we offer coffee and tea facilities, electric kettle and a fridge. DSTV is also available. 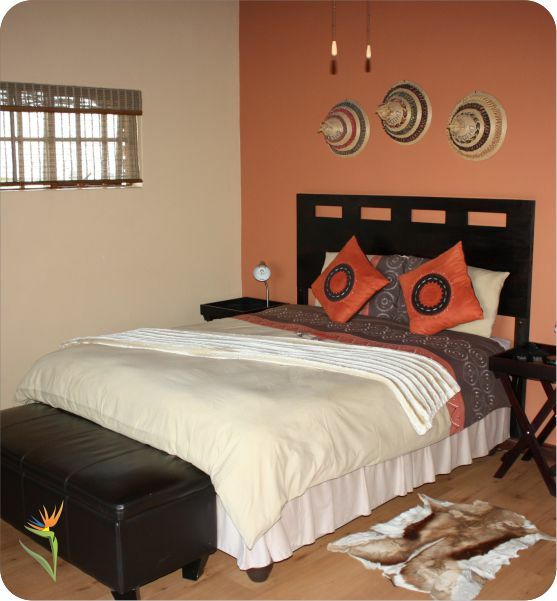 This room is situated in the main house overlooking the pool on the 1st floor. 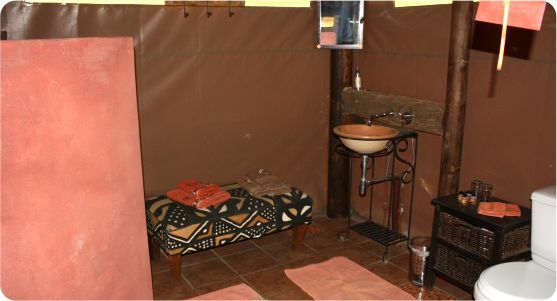 Okavango has a double bed and an en suite shower. For your convenience we offer coffee and tea facilities, electric kettle and a fridge. DSTV is also available. 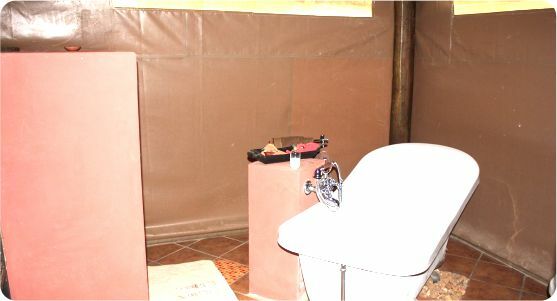 The Induku has two single beds, a sleeper couch in the loft ( which can be used as bed at extra costs) and an en suite shower. 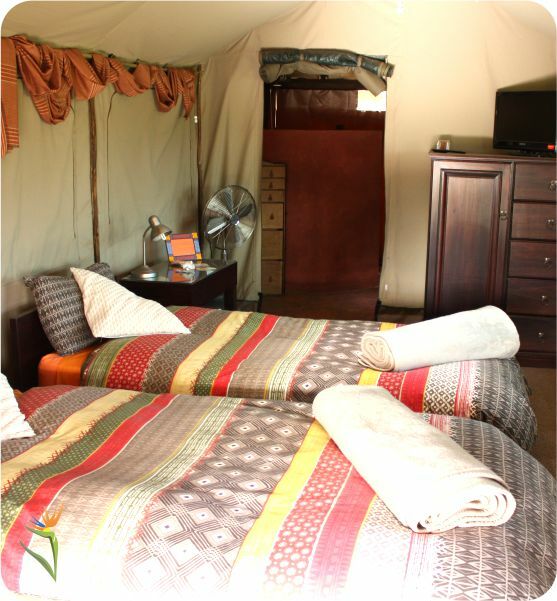 The Caprivi Safari Tent boasts a double bed and an en suite shower and Victorian bath. 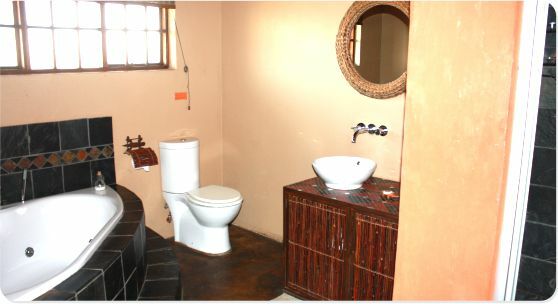 For your convenience we offer coffee and tea facilities, electric kettle and a little fridge. DSTV is also available. Has a double bed and an en suite shower. All guestrooms were fitted with fanlights. 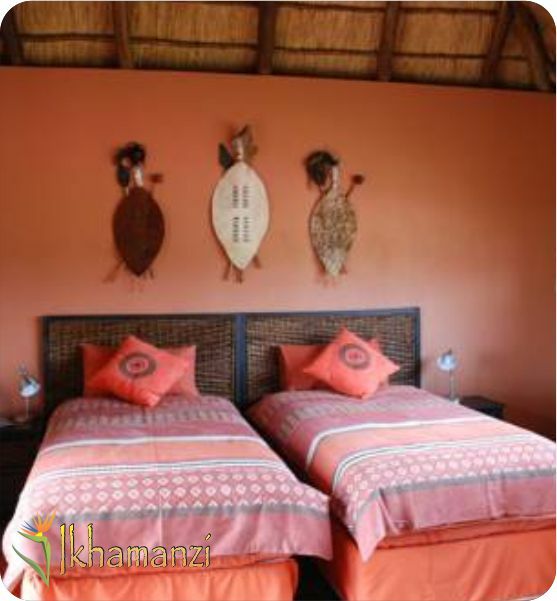 A thatched roof provides natural isolation, therefore we have decided not to install air conditioning. 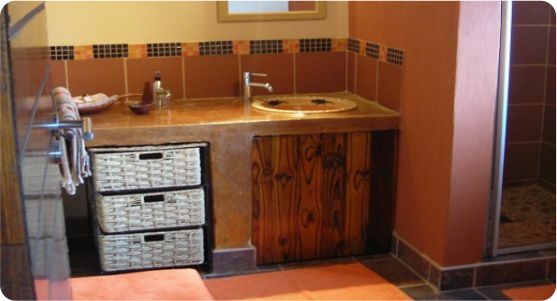 All rooms are supplied with linen and towels as well as bathroom amenities such as soap, shampoo and shower gel. 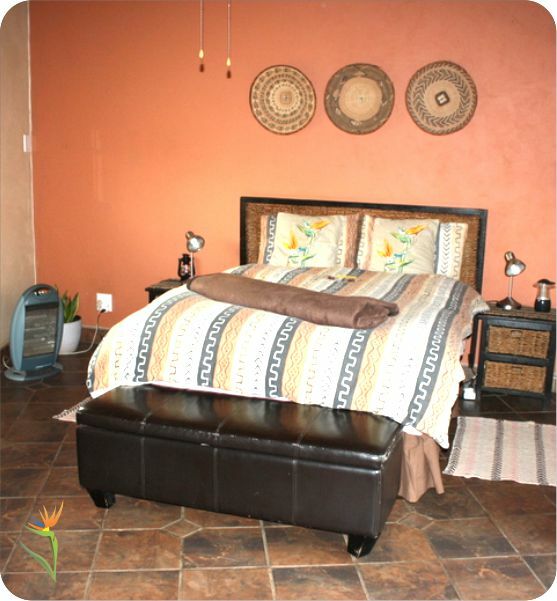 In winter we offer electric blankets, in each room is a heater as well. Dinner on request. "Fondue" or "Raclette" evening (from Switzerland). Please enquire, we will organise! Minimum 4 people, maximum 6 people. All the prices include breakfast! Spas & Massages can be made available on request but there are areas close by aswell, Hot Tub, BBQ Facilities, Outdoor Swimming Pool. At the moment we do not offer any internet but there is good reception in our area. A 50% deposit is required to confirm the booking. However Ikhamanzi will send detailed terms & conditions for cancellations before the booking is made. Children under 3 years are accommodated free of charge, while children up to 12 years pay 50 % if staying in their parents’ room. Note that there is an open dam and pool on the property. IKHAMANZI can not be held responsible for any injury or damage. Parents are requested to supervise their children at all times.